On January 1 of this year, few would have predicted that Egyptian dictator Hosni Mubarak would soon be removed from office. 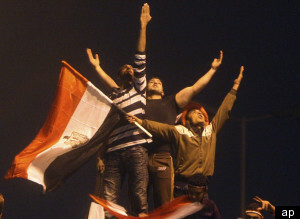 But just three weeks later, thousands of Egyptians gathered in Cairo’s Tahrir Square to begin the push for change. In the aftermath of Tunisia’s political shakeup, Egyptian citizens called for an end to the authoritarian regime that controlled their lives. Never before had Mubarak faced such a massive challenge. After decades of torture, corruption, and fraudulent elections, the Western world’s favorite “moderate” dictator was about to be removed from power. Looking back, there were key underlying political conditions that made this popular revolt possible. After enduring some 25 years of dictatorship, Egyptian activists had already broken the taboo of publicly challenging Mubarak’s regime in 2004 and 2005. And with the dictator’s ailing health, the Egyptian public faced the specter of a 2011 handoff of power from the father to his son, Gamal Mubarak. Trapped between a dictator and the heavy US investments that supported his regime, the Egyptian public was ready for the Tunisian spark that inspired them to action. Whatever their rivalries, the authoritarian leaders of the Middle East did not want to see Hosni Mubarak removed from power. When you are a dictator – even with the title “King” – the forced departure of another dictator is not the kind of precedent you want set. Worth noting is that this group of Mubarak loyalists was joined by Israeli leaders as well. Though frequent in their exhortation of democratic values, Israeli officials offered a degree of praise for Mubarak at a time when hundreds of his own people were dying in protests against his regime. Over the last two months, the US government has dramatically increased drone missile strikes in Pakistan. Unfortunately, mainstream US newspapers have not shown the inclination to ask tough questions regarding the change in policy. In a replay of the softball coverage that preceded the second US invasion of Iraq, some of the biggest US newspapers are once again showing how easy it is to embed a pro-government bias in their reporting. The Wall Street Journal, Washington Post, and The New York Times have all covered the news by mostly quoting US officials while ignoring critics. Alternating between criticism and praise, Pakistani Foreign Minister Shah Mahmood Qureshi spoke about US-Pakistan relations at the Harvard Kennedy School on Monday, October 18th. 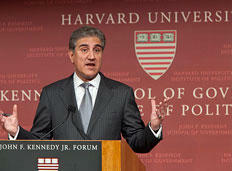 Qureshi was at HKS on the eve of a US-Pakistan strategic dialogue with senior US officials in Washington DC. In his comments, Qureshi offered blunt criticism of the history of US foreign policy towards Pakistan. “We see half a century of indisputable, empirical evidence of the US dancing with dictators who subverted human rights, using our people and soldiers as surrogates in proxy wars,” he stated. Jewish settlements [themselves] are illegal. How can we talk on the extension of [the] moratorium or extension of Jewish settlements? In the June 1st edition of the Washington Post, journalists Scott Wilson and Laura Blumenfeld uncritically repeat Israeli claims regarding the Gaza aid flotilla as fact. Wilson and Blumenfeld should recognize that Israeli officials have a vested interest in discrediting the activists who challenged Israel’s blockade of Gaza. Instead, the reporters wrote a piece in which they presumed to know what Israeli officials were thinking — not just what they were doing.